The best way to kick off the new year is to play a show! The first weekend of the freshly started year the band drove to the iconic German city of Hamburg. At first with the intention to play only a show a Friday night and returning home the next morning but ending up spending the whole weekend. It is Friday morning and Harmen had already gathered almost the whole band with his van, while Twan and I were getting ready to leave with our own car. After a smoking five to seven hour drive (depending on the vehicle) we arrive at the place where the action is going to happen: Kukuun at the famous Reeperbahn. In broad daylight and with the rainy weather this street is kind of depressing. But we will later notice, that even on a cold January-evening, when darkness takes over and all the bright neon lights start flashing, this streets keeps his well known reputation. Inside Kukuun are the organisers of Ballroom Hamburg, Ollie especially, already waiting for us. They are very excited to have us and we feel very welcome from the start. The band jumps on stage directly and starts building and soundchecking their gear. Meanwhile I talk to Ollie about the programme of the night and I have to fill in some documents concerning music rights. Afterwards, Harmen and I decide it’s no use waiting at the venue. We drive to the hotel with our car and his van and make sure check-in is arranged. At the hotel we meet Eric and Kristin who had just arrived. That makes it even easier to arrange everything! We check the rooms, they look very decent and I make a short video so I can show the band where they will be sleeping. And directly return to Kukuun with just one car. It’s better to leave the van at the hotel and tonight we will use taxi’s to get back. At Kukuun the band has almost finished their soundcheck. They’re very happy with the sound. Also, they got the news the whole show will be filmed! This will be a good night, because of the relatively small, but very beautiful venue. All the walls of the club are white, which gives it a special vibe. Today we’ll have Indian food! After some relaxing time our spicy but very tasty dinner arrives. In front of the stage we sit down and eat. We’ve just finished our food when the first visitors arrive. Soon Kukuun gets filled with fans and Eric and the band get ready for action. As soon as the the intro sounds, they put on their orange masks and when Twan taps on his drums, everybody starts playing and the song Helter Skelter floods through the venue. From the first second of the show until the last one, the audience is almost ecstatic. People sing the words with Eric, they applaud and they dance. The vibe is great, almost spiritual. The show is a combination of songs of Saviour Machine, David Bowie, Bob Dylan and Lou Reed. Afterwards, Eric and the band joins the crowd at the bar and we all have some nice conversations. It’s time to go and our hotel has a nice living room with a fridge with drinks. That’s all we need and everybody who wants, can join us. At the living room in the hotel Eric is giving an interview, Bas is playing guitar, some people are singing and the rest are having a drink and a lot of fun. But the concierge of the hotel is not enjoying this at all… and asks us to leave. The group decides to check out some bars in the neighbourhood, Twan and I go to sleep and Eric stays to finish his interview. The next morning we all meet again at breakfast. Some sleepy faces but in general everybody is smiling! We all had a very nice evening. Twan and I want to see the city so we head out. The rest of the group is going back to sleep or take some time to relax. We sure want to see more of Hamburg then only the Reeperbahn. The city has so much history. We buy a daycard for the subway and take one the eastside of the city. When we leave the subway station first we see the Binnenalster which is a river that runs to the city center. It feels more like a lake surrounded by big, historical buildings. The next tower we walk to is the St. Katharinen Church with it’s round shaped top. Also the building in between these monuments are very nice. And it also feels a bit abandonent with only a few tourist walking around. Did you know Hamburg has a Unesco World Heritage site? Speicherstadt is the name of a whole district that’s on this famous list. We read on Wikipedia: ‘The Speicherstadt… is the largest warehouse district in the world where the building stand on timber-pile foundations, oak logs, in this particular case.’ It’s striking because this district has a very modern feeling while it was build in the 19thcentury. After some ‘Kafee und Torte’ we walk through HafenCity. The harbour-area with very interesting architectorial buildings. There is still a lot of building going on right now, so this area will probably look different in a couple of years. And it’s very strange but apparantly all the tourists in Hamburg are all in this area. Suddenly it’s crowded with people taking pictures, walking to the café’s and seeking some shelter from the rain that every now and then falls out of the air. 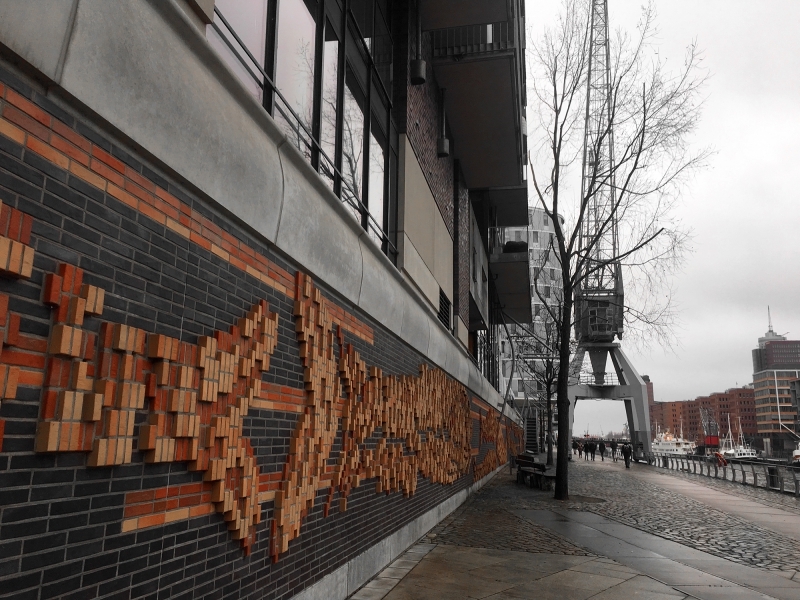 We enjoy the architecture and walk until we arrive at the Elbphilharmonie, one of the most famous buildings of the city. This eyecatcher is said to be one of the biggest concert halls of the world and also one of the most acoustically advanced ones. The upper level of glass is impressive and modern and visible when you drive through Hamburg. We cross the water of the Binnenhafen and follow the Baumwall, an embankment at the harboursite. Our walk ends at Landungsbrücken, an logistic hub where you can take the U-bahn, S-bahn or embark on a ship. It’s a nice building and a very busy place in the city. When we return to our hotel, the other band members are listening to some recordings of yesterday’s show. I take some time to relax, while Twan joins them. It always good for them to evaluate and know what was good and what went wrong. In the evening Ollie takes the whole band for dinner. It is his birthday and he is organising a big party tonight. And we are all invited. This party turns out to be in Knust Hamburg, a awesome live location. There are three rockbands playing and the party is BIG! We recognise a lot of faces from the audience from yesterday’s show. These Hamburgers sure know how to throw a party!